From the Pompeii outdoor lighting range. 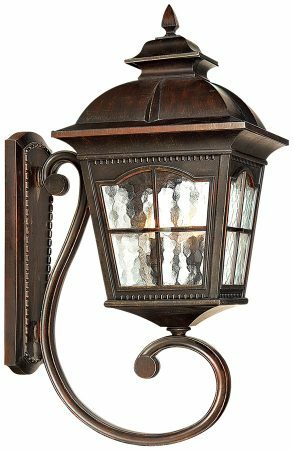 A 430mm high rustic cast aluminium brown stone finish windowed lantern, with textured clear glass inset panels, curved scroll support arm and matching finish wall mounting plate. A traditional IP44 wall lantern suitable for almost any outdoor application and capable of taking energy efficient lamps. Complete with a three year finish guarantee.